Time flies by so quickly! It’s already the end of the month and I have yet to put up a post this month. 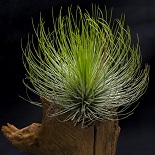 In keeping with my resolution of restarting my blog, here’s a post on Tillandsia balbisiana. Balbisianas are what many consider a beginner plant, which I guess means it is adaptable and tolerant of a wide range of conditions. My balbisiana has received no special care whatsoever; it receives a daily drenching and is in full sun till about midday, followed by bright shade. It is surprisingly (well surprising to me at least) tolerant of dry conditions, as given its thin leaves, I would have expected it would need more frequent watering. Its long thin leaves flow down elegantly and it has a nice delicate look about it. The plant I have is about 50cm in height, with the flower spike adding another 60cm or so to its total height. So a nice tall plant.I am guessing the spike started developing in January as the pic I have below was taken at the end of February and the spike was already a good height. All in, I think it took about two months for the flower to mature. The flower spike took me by surprise as I was expecting a simple inflorescence with the standard flowers. It ended up having many branches, as you can see below. It also had a nice blush to it! What was even more surprising; I went to have a closer look at the flowers one day and I noticed that seedpods had already developed. This was before the plant was even done blooming. I managed to get some pics of the spike with both seedpods and flowers! I found this pretty amazing as I always thought it took quite a few months for the seedpods to develop. Even with T. ionantha the pods do not appear till many months later. The other thing that took me by surprise was just how long it took for all the flowers to bloom. From the very first purple flower at the base to the final one at the top took a good six weeks! For someone accustomed to the two-day blooms of T. ionanthas, I have to say I was very impressed. Well the plant has finished flowering now and I have found just one pup. However I have counted at least 20 seedpods! I’m not sure what I’m going to do with so many seeds as I have had limited success with germinating Tilly seeds. They do really well initially then just seem to die back after a few months. Oh and for those who are wondering, I believe most of the pods are self pollinated as the ants have been extremely busy on this particular flower spike. I may have had a go with pollinating with other blooming Tills but I can’t recall if I did now! To end the post, I have included some pics of another balbisiana I have which is currently flowering. The second balbisiana I have has a simple inflorescence and a pup which is also starting to flower, hence the reddish tinge on the pup (I was initially puzzled why it was red as the pup is tiny and I was not expecting it to flower so soon). Happy growing everyone! This entry was posted on July 21, 2018 by minigemm in Tillandsia and tagged balbisiana, bloom, flower, Malaysia, offset, offsets, pup, pups, tillandsia.